Last summer hosted a wide variety of plays, music, dancing, and puppets from outer-space. 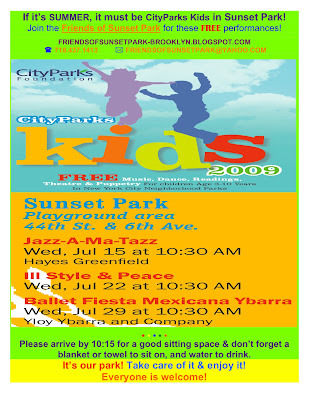 This year, the Friends of Sunset Park and CityParks Kids are giving us Jazz, Peace, and Mexican Ballet. It all starts this Wednesday with Jazz-A-Ma-Tazz. Hayes Greenfield hosts "an interactive music education program that inspires participants to take risks, gain confidence, and experience a sense of personal achievement through the use of jazz and the art of improvisation." Sounds like a fantastic musical experience for the kids and those they bring to the show. All the shows start at 10:30 AM, and they are well attended. (They are popular with the local day camps as well as care-givers and park-goers.) Get there early for a good seat.